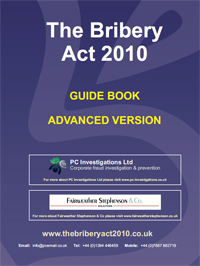 This course is designed to give the participant a basic understanding of bribery, The Bribery Act 2010, the implications of the Act and how it may affect them on a day to day basis in the course of business. What are the major risk areas? This course is designed to give Directors, Owners, Senior Managers and other personnel in positions of high risk an understanding of bribery, The Bribery Act 2010, the implications of the Act and how they should operate as a result of the Act. The Basic and Advanced guide books contain all of the content of the respective learning modules excluding the review questions and assessments. The books are designed to be issued to all relevant personnel as an aide memoir and can also be used as a study guide for those completing the modules.